Moxa provides marine-certified computers for oil spill detection systems that process real-time data collected from remote sensing networks to enable mission-critical recovery operations. Oil spill contingency plans are essential to minimizing the risk of oil spills in the ocean. The success of these plans depends on accurate, real-time data on the location, size, and ...movement of a spill and a powerful computing infrastructure that can consolidate and process this data to support monitoring and recovery operations. Moxa manufactures marine-certified embedded and panel computers for the oil and gas industry. 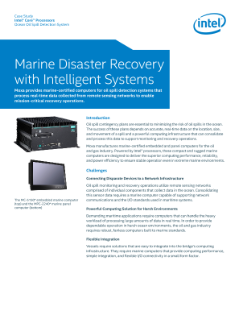 Powered by Intel® processors, these compact and rugged marine computers are designed to deliver the superior computing performance, reliability, and power efficiency to ensure stable operation even in extreme marine environments. Oil spill monitoring and recovery operations utilize remote sensing networks comprised of individual components that collect data in the ocean. Consolidating this sensor data requires a marine computer capable of supporting network communications and the I/O standards used in maritime systems. Demanding maritime applications require computers that can handle the heavy workload of processing large amounts of data in real time. In order to provide dependable operation in harsh ocean environments, the oil and gas industry requires robust, fanless computers built to marine standards.